There is a lightness in his step and a gleam in his eyes. Dapples glow golden on his dark flanks, and with a sudden lunge, he leaps upward, airborne, in an exuberant show of prowess. Despite his rather advanced age of 25, Awesome Again is clearly raring to go for what will be his 21st season covering mares at Frank Stronach’s Adena Springs in Kentucky. While he may be on the twilight side of life, the son of Deputy Minister and 2000 Broodmare of the Year Primal Force, by Blushing Groom, is just as relevant as ever at the summit of US racing. He is the maternal great-grandsire of Triple Crown winner Justify and the damsire of another Horse of the Year candidate, Accelerate, while his son Bravazo was also was a force in 2018, placing in five Grade 1 races including the Preakness Stakes. 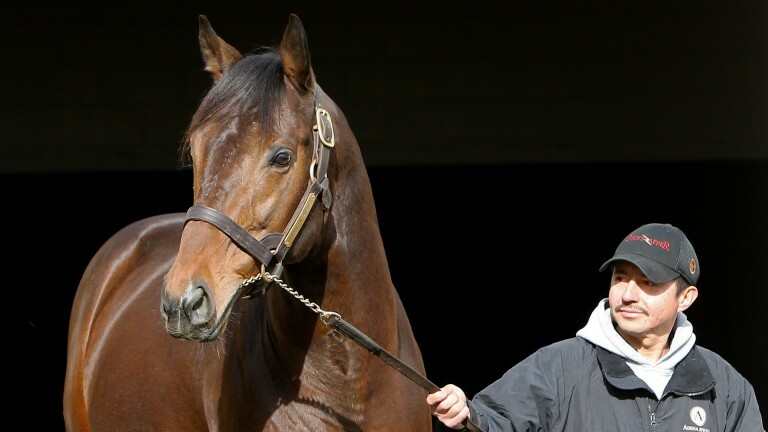 Over the course of his two decades at stud, Awesome Again has not had the privilege of covering particularly large books of mares, averaging 71 foals in his 18 crops of racing age. 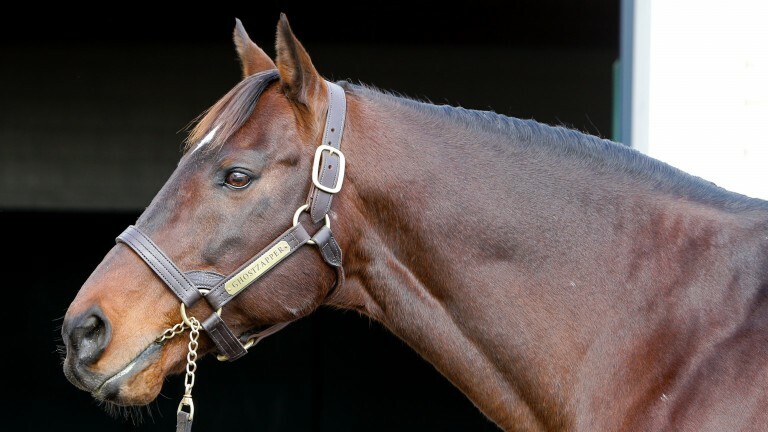 Yet he has established a dynasty for breeder Stronach, with Adena Springs also standing his best son, 2004 Horse of the Year Ghostzapper, and his grandson, multiple Grade 1 winner and Canadian champion Shaman Ghost. Compact in stature, Awesome Again is known for being hickory tough, a characteristic he passes along to his offspring. He has survived two colic surgeries weeks apart and partial facial paralysis caused by a broken bone near his jaw that affected his muzzle, an eye and an ear. With that determination, he has indicated he is not ready to give up his work in the breeding shed. 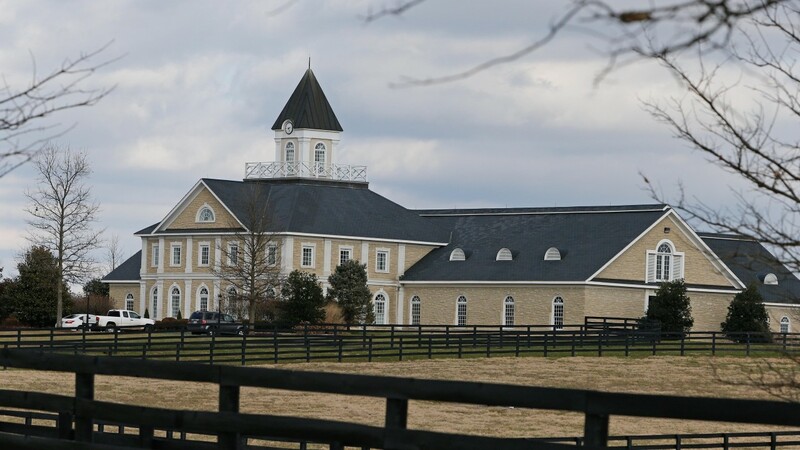 “He still loves his job, so why should he retire?” declares Adena Springs stallion manager Bill Drury, who has worked with Awesome Again for his entire stud career and knows the horse better than anyone. 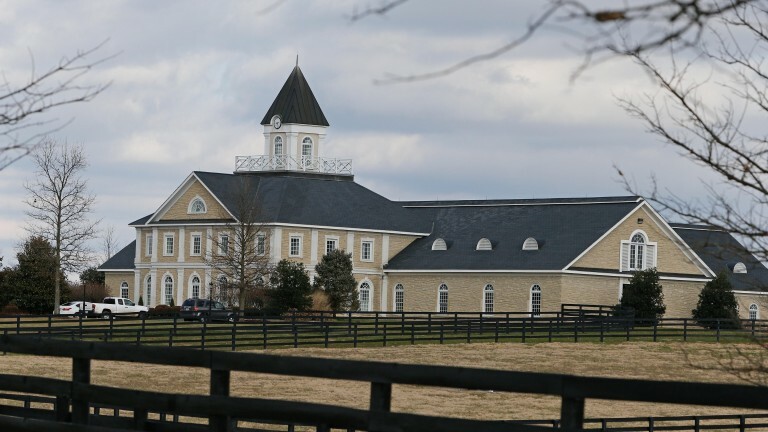 “This is the house that ‘Awesome’ built,” he says, extending his arm and pointing across Adena Springs’ expansive stallion barn and office complex. “He’s a legacy. There isn’t another stallion who has sired four Breeders’ Cup champions – and it would have been five if Game On Dude had won [the 2011 Classic after leading for most of the race before being headed close home by Drosselmeyer]. The plan for Awesome Again in the upcoming season is to limit his book to around 20 to 25 mares to start with, Drury says, and breed him only once a day and only in the mornings, following a management schedule that worked well in 2018, when he covered 48 mares. “Halfway through the season last year we realised that most of the pregnancies were coming off morning covers because he’s older. And even though he’s still good, he maybe needs more time to recuperate,” he adds. “So, we went to breeding him one time a day, in the morning, and we doubled his fertility in the second half of the season. “This year, we’re going to start with a small group of good mares, probably mostly owned by shareholders at the beginning, and then really be picky about those mares. I don’t want a 19-year-old barren mare going to a 25-year-old stallion. We want to give him a good shot at it. As he gets them in foal, then we can add to the book." Awesome Again, whose fee is listed as private, is one of nine stallions who ranked among North America’s top 100 sires by progeny earnings last year and are returning to duty this season at age 22 or older. 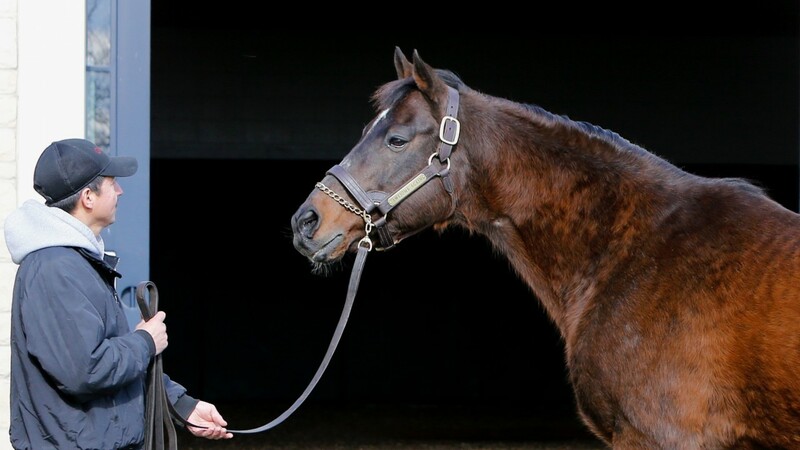 Leading the way by age among those elder statesmen is WinStar Farm’s 26-year-old Distorted Humor, who last year covered a remarkable 136 mares. Tale Of The Cat, who stands at Coolmore’s Ashford Stud, and Stormy Atlantic, a resident at John Sikura’s Hill ‘n’ Dale Farms, are from the same crop year as Awesome Again and they are set to stand for $25,000 and $10,000 respectively this year. Most older horses develop a long coat in the winter, and Drury says that Awesome Again was so woolly last month that he “looked like a mastodon” and was quietly taken out of duty for Horse Country tour visitors. After being placed under lights on December 15 to prepare for the breeding season, he is getting slicker, more like the sleek bay colt he was when he defeated champions Silver Charm, Swain, Victory Gallop and Skip Away in the epic 1998 Breeders’ Cup Classic at Churchill Downs. “He’s grown long hair in the winter ever since he was five years old,” Drury says. “We’ve been working on it, and in another two weeks, come February, he’ll be different. A primary reason Awesome Again has been able to stay active and overcome physical adversity is his sensible, low-key nature. “He’s as easygoing as any. He’s been that way since go. He’s just a real relaxed horse,” Drury says. Those qualities were key to Awesome Again recovering from serious maladies. For a long time a cribber, he was diagnosed with a broken stylohyoid bone in his jaw area, and eventually that bone calcified and pressed against a nerve, causing temporary paralysis of part of his muzzle, left eye and ear. Awesome Again underwent surgical procedures that included sewing up his eye to allow an ulcer to heal, and while he still receives eye medication for lubrication, he can see and has no other problems with it or his ear. His muzzle, which had been frozen at an awkward 45-degree angle, also returned to normal. In 2011, Awesome Again was struck by colic that required surgery to remove a lipoma in the small colon. Drury took a chair and blanket and slept outside the horse’s stall at the Rood & Riddle Equine Hospital in Lexington to provide a familiar reassurance. “When we thought we had him about recovered, within 30 days he colicked again. We didn’t want to open him back up; he still had softness in the area. But they went in and found another spot in a different area, a little higher," Drury remembers. “How many horses do you know who would have come out of that? He’s the only horse I know who colicked twice within a 30-day span and lived to tell about it – or lived for me to tell about it. In addition to Wilko, who won the 2004 Juvenile, and Ginger Punch, who captured the 2007 Breeders’ Cup Distaff, Awesome Again’s record group of Breeders’ Cup winning progeny includes 2006 Breeders’ Cup Distaff winner Round Pond and Ghostzapper, who followed in his sire’s hoofprints by winning the Classic in 2004. Awesome Again has also sired Calumet Farm’s Preakness Stakes winner and sire Oxbow; eight-time Grade 1 winner Game On Dude, who banked $6.49 million, and other Grade 1 winners Awesome Gem, Daaher, Spun Sugar, Sugar Shake, Toccet and Dubai Escapade. Ghostzapper is a bigger version of his sire, standing 16.1 hands, and has a more spirited nature. He covered 132 mares in 2018, when he had 11 offspring win stakes races and his grandson Justify raced to Triple Crown immortality. “If you wanted to fight, he would fight you,” Drury says of Ghostzapper. “He’s more active, but in no way is he really aggressive. He’s just a professional in everything he does. Ghostzapper’s son Shaman Ghost, a robust yet nicely balanced 16.2 hands, is standing his initial season at Adena Springs after covering 92 mares in California during his first year at stud in 2018. A seven-year-old, Shaman Ghost is full of youthful energy as breeding season approaches, Drury says. In looking over Adena Springs’ dynasty and two close relatives also standing at the farm – Awesome Again’s half-brother Macho Uno, a son of Holy Bull and sire of five Grade 1 winners and millionaires, and Macho Uno’s Breeders’ Cup Classic-winning son Mucho Macho Man – Drury reflects that he counts himself fortunate.